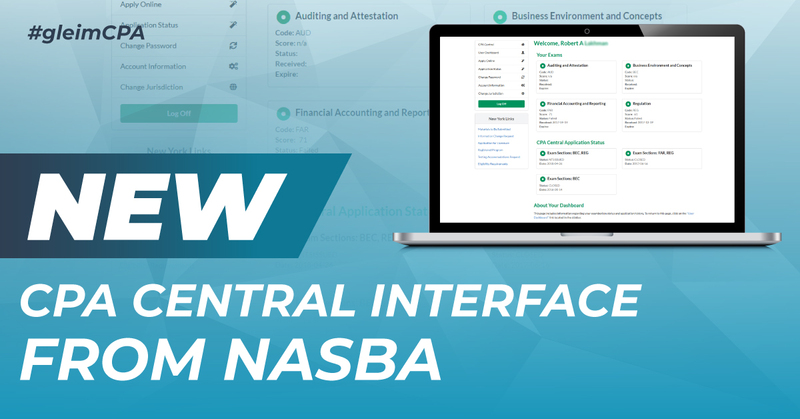 We’ve got exciting news for CPA candidates: The National Association of State Boards of Accountancy (NASBA) has upgraded the CPA Central interface! CPA Central is a resource for candidates working with a state board that uses NASBA’s CPA Examination Services (CPAES). Compared to the old platform, the new interface features a crisp design and more helpful features. As NASBA’s headquarters for the CPA Exam, CPA Central supplies candidates with everything they need to complete the exam process in one place. 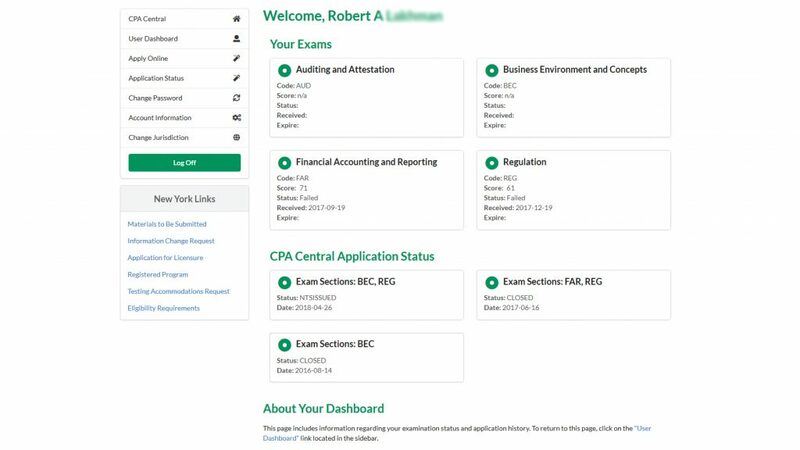 The user dashboard allows you to view your status and history with the CPA Exam applications and sections. It also includes CPA information specific to your state board. You can see if your state board of choice participates in CPAES by checking the list on NASBA’s website. What Does CPA Central Look Like Now? The CPA Central interface is more streamlined and a bit less colorful than before. Overall, the new look is clean and user-friendly, as the updated user dashboard demonstrates. The changes to the user dashboard are more dramatic, so we’ll focus on those. The user dashboard greets candidates by name prior to presenting a series of boxes displaying your exam section and application progress. For each exam section, these boxes reveal your score, status, credit reception date, and credit expiration date. For each application, the boxes tell you whether the NTS has been issued (meaning you can sit for that section) or the application is closed (meaning you’ve taken that section or your NTS has expired). On the left side of the page, you’ll see the general menu. If you’re a first-time candidate, you can use this menu to apply for the exam and check your application status. New and returning candidates alike can also use this menu to review their account information and change their passwords or jurisdictions. This menu features simple icons reinforcing the purpose of each option. With this expanded selection of resources, you can accomplish so much more within CPA Central. What Other CPA Tools Are Available? As you can see, CPA Central is essential for earning the CPA certification. Another CPA tool you can’t live without is a review course. The right CPA review course gives you everything you need for CPA Exam success. With our comprehensive coverage, exceptional support, and massive test bank, Gleim CPA Review is the best exam prep on the market. We’ve helped candidates pass over 1 million CPA exams, and we can do the same for you. Let us help you move forward in your certification journey today by accessing our free CPA Exam guide.